Last night I took on the daunting task of babysitting my 6 and 9 year old cousins for a “girls night”, and to say it was the best form of birth control out there would be the understatement of the year. Currently my floor is covered in glitter, tables are smothered in sprinkles, icing is everywhere, and I’ve watched Cartoon Network since 6am. Parents, I don’t know how you do it. Despite having potentially 5 hours of cleaning ahead of me, I love these sweet girls and having family together during the holidays is the best part of this time of year. Food is what brings my family together (and let’s be real, wine too), which is why I’m so excited to share this recipe with you all. If you celebrate Christmas, this is the perfect breakfast to wake up to since you can make it the night before and bake it while you open presents! I call it creme brûlée french toast since it has the flavors of orange, vanilla, and caramel with a crunchy sugar topping that we love so much from the classic dessert. Best of all it’s so easy, takes just a few ingredients and can be made the night before. 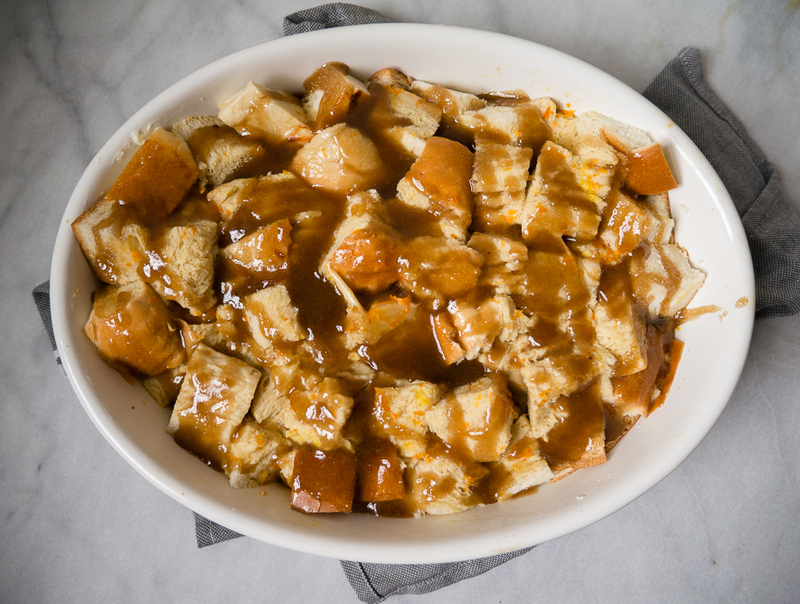 I’ve made it for potlucks, brunch parties, and for my cousins, and it’s gotten rave reviews every time, so I’m super confident your family and friends will love it too! 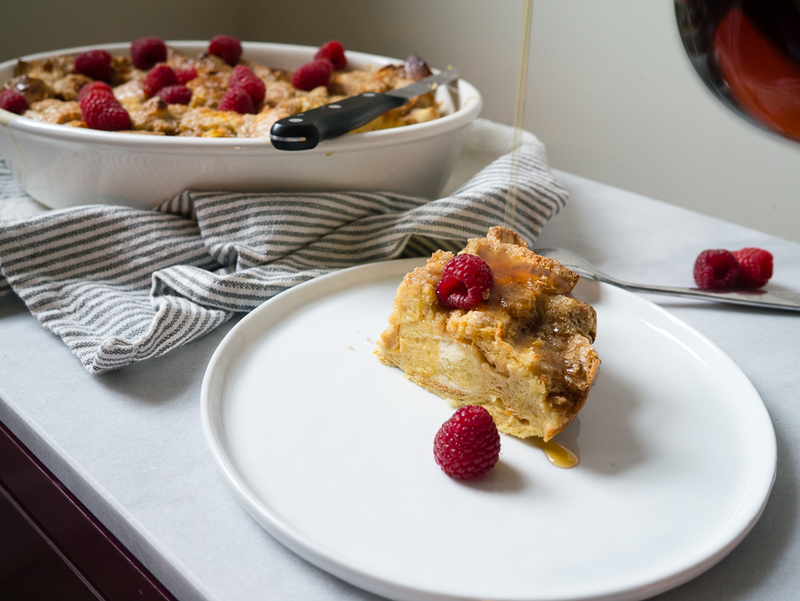 I topped mine with fresh raspberries to add some festive color and brightness to the richness of the dish, but you could use whatever berry or fruit that you like. 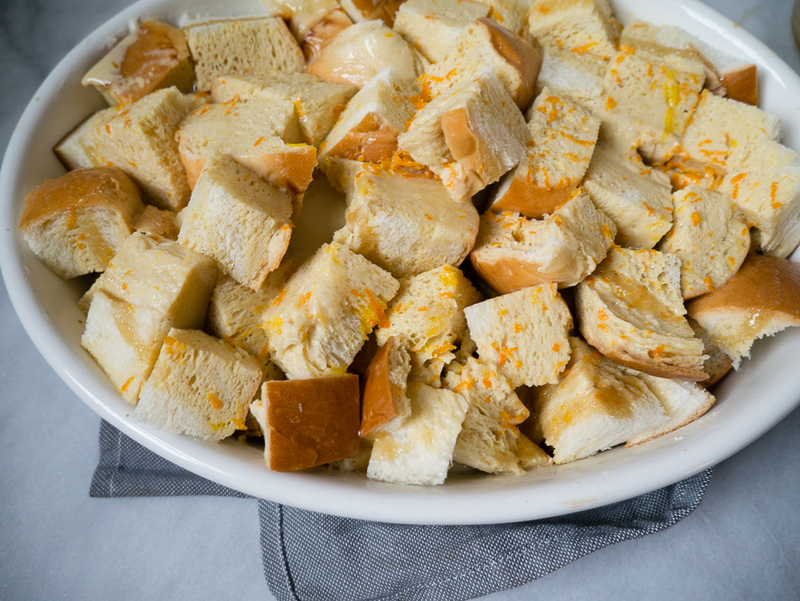 Butter a large baking dish and cut a loaf of challah into cubes. Maybe it’s the Jew in me, but I think there’s no better bread for French toast than Challah, and they have the best loaf at Trader Joe’s. However, if you can’t find it brioche would work great as well. We then make a quick custard batter from fresh orange zest, eggs, half and half, and brown sugar. Pour that all over the bread and make sure it soaks in everywhere. Our final step before baking is to pour over warm brown sugar and butter that caramelizes during baking. I know, I’m drooling too. It emerges from the oven perfectly crisp, bronzed, and bubbling since that brown sugar syrup we poured on top provides the crunchy top we love so much from creme brûlée. Top with fresh berries, and you’re good to go! ^^ I finally got the girls to sit and eat instead of watching “How to Wrap Your Cat for Christmas 101”. If this French Toast can do that, it can do anything! 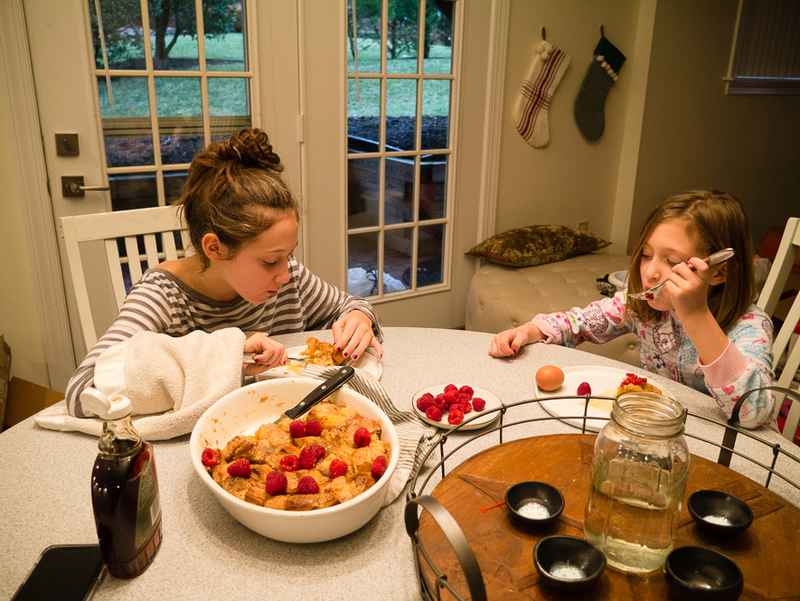 Happy Holidays to you and your family, and I hope this French toast becomes a new tradition for you like it has for us! 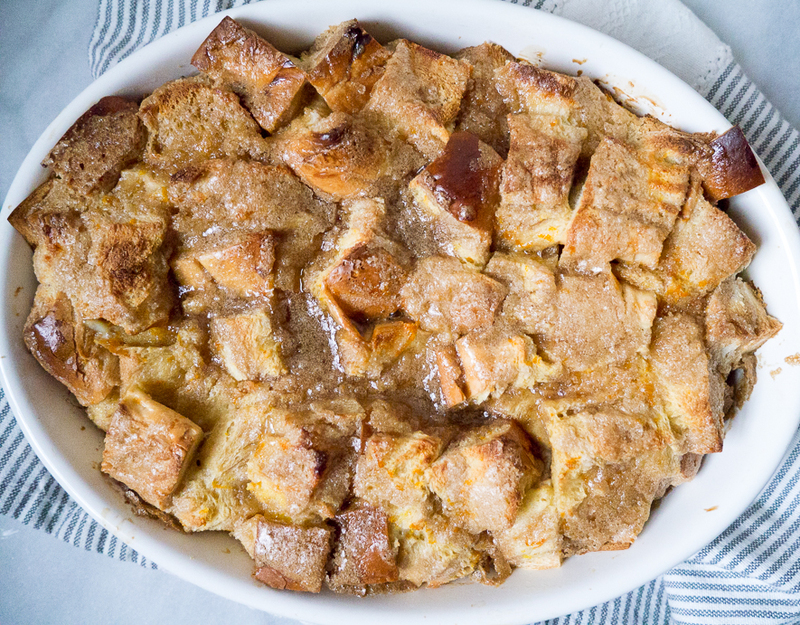 Butter your baking dish, I used a large 12x 9″ oval one from Ikea, and if you plan on baking the French toast right away preheat your oven to 350 degrees. 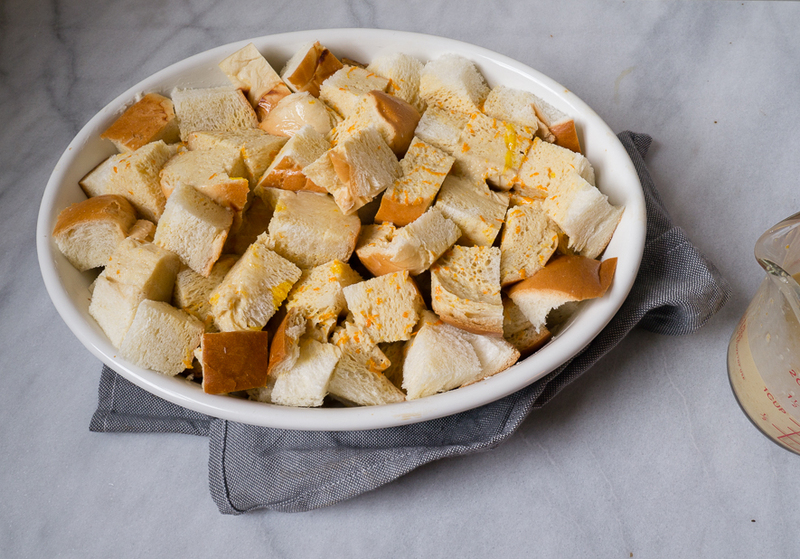 Place Challah cubes into the buttered baking dish. Combine eggs, half and half, vanilla, orange zest, salt, and 1/2 cup of brown sugar in a bowl or measuring cup, and whisk until well combined. 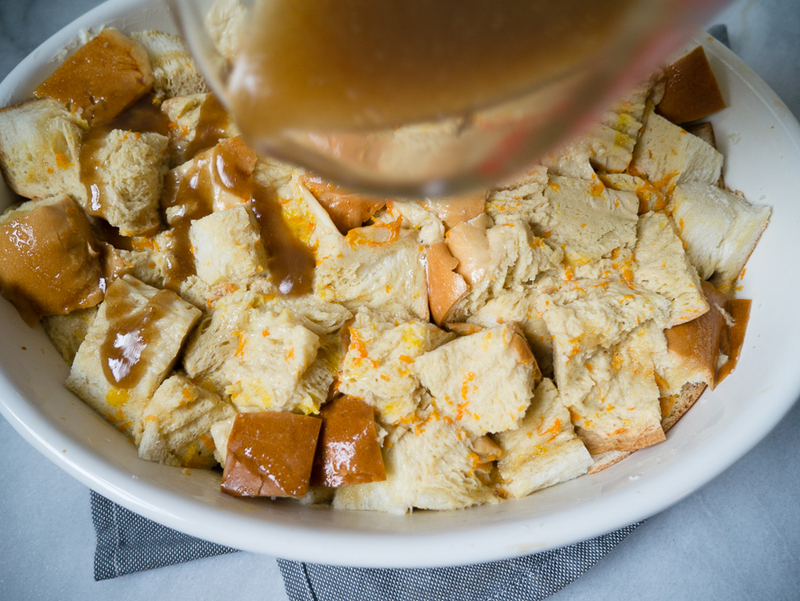 Evenly pour custard batter over the Challah bread, ensuring all parts of the pan are evenly soaked. 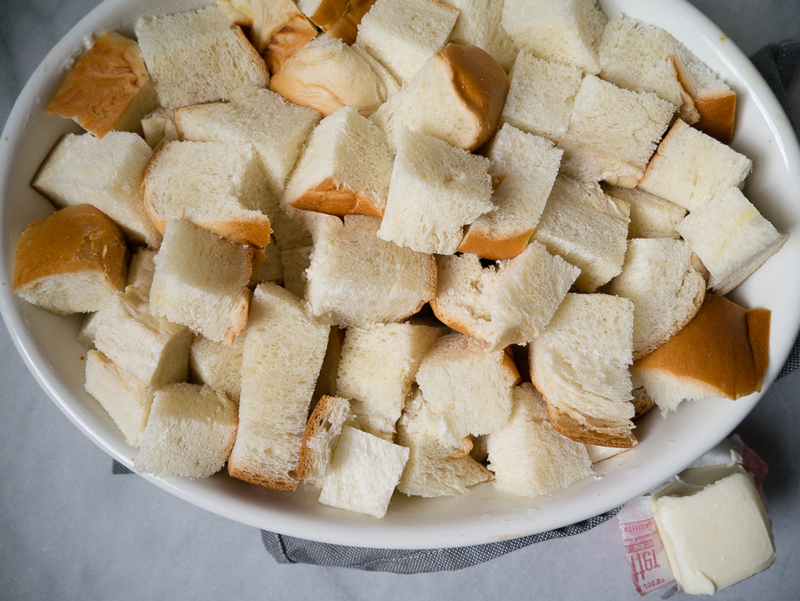 I use a fork to gently press the bread into the batter so there aren’t any dry pieces. 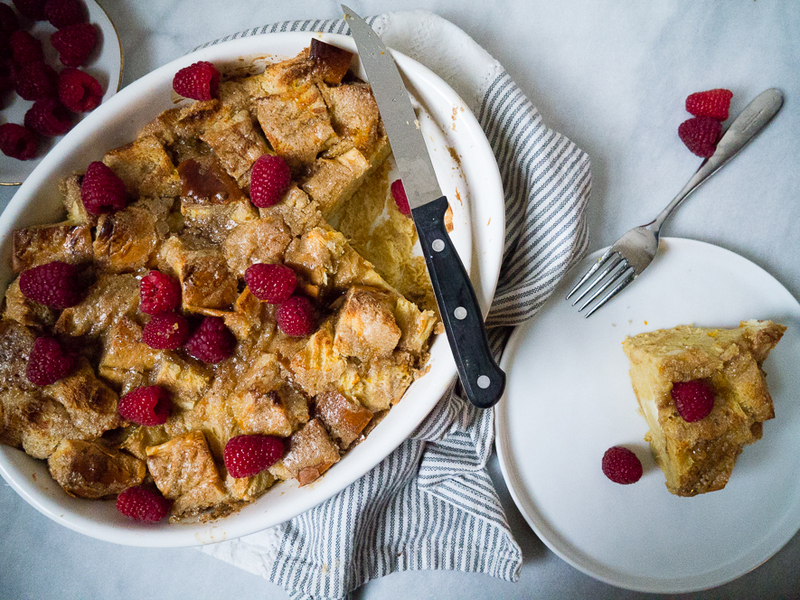 At this point if you’re going to leave the French toast overnight and bake it in the morning cover with foil or plastic wrap and put it in the fridge. In the morning, unwrap and continue with the rest of the instructions. In a microwave safe bowl combine butter and remaining 1/4 cup brown sugar. Microwave for 30-45 seconds until melted, and stir until well combined. Pour the brown sugar butter mixture evenly over the French toast. Bake for 40-45 minutes until top is golden and caramelized, and the inside is hot. I insert a knife into the middle to ensure the custard has been cooked. Note that the larger your dish, the less time it will take to bake since the French toast will be thinner. 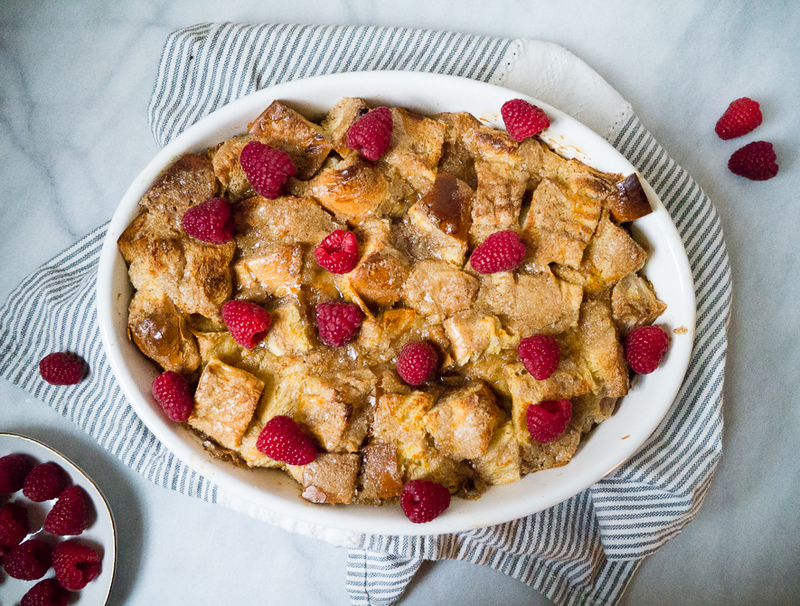 Top with fresh raspberries, drizzle with maple syrup, and enjoy!